When Todd Yvega first told me about this recording of FZ's music done by a Finnish ensemble on baroque era instruments, I was of course very curious but also a little bit suspicious whether such a concept would work with FZ's music - at first glance it did not look like the ordinary approach to this music at all. But when one thinks twice there are in fact many moments and elements in FZ's works that evoke references to renaissance and baroque music -for example on the 'Uncle Meat' album, with all the harpsichords, processed woodwinds and organs. 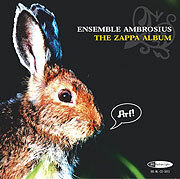 How logical that the title track of this very album became an initial moment of Ensemble Ambrosius. What made me even more curious was the fact that many pieces I saw on their track list were numbers which (in FZ's original recordings) utilized rock rhythm sections, a lot of electric and/or electronic instruments and other tools unknown to the baroque era. They even had arranged two pieces which originally had been realized with the Synclavier Ð pure electronic music, so to speak... Well, the more I thought about it, the more doubts I had: how would they handle all these elements which are so essential to these compositions? What would the performances of the grooving and swinging sections sound like? How would they handle the solo improvising sections? And how would the compositions survive such a radical change? Would the music still have that uniqueness of being entertaining and heavy at the same time? Or would it become just another boring performance of "so-called classical musicians" trying to play pop-rock-jazz-or-whatever-you-want-to-call-it-kinda-music...? But after listening to the first tracks I soon thought that these guys were really rocking. There were great arrangement ideas, wonderful colors, unconventional usage of instruments, unexpected turns and cool combinations. And all this brilliantly played with just the right attitude to make this music work. It's so very convincing how the possibilites of these instruments were extended in order to make this music (which was conceived for a completely different sound world) work so well on them. Obviously they had also had fun, for there wasn't a hint of stiffness. It all sounded so easy. I can well imagine however that it WAS indeed a lot of work (just think of the transcribtion job, since they didn't use any printed material...). So, about 30 minutes into the recording I had forgotten about all these issues Ð the used (and not used) instruments, playing techniques, musical styles, basso continuo, transcribtions, etc. I was just enjoying the music, which was so familiar, but yet sounded so different. I'm sure that this CD will find many, many like-minded listeners, who will enjoy this very unusual and daring project. If they are already familiar with Zappa's compositions they hopefully will discover new aspects in his huge body of work. Or, if they are new to this composer (and maybe only have listened to music of the pre-Haydn era played on gut-stringed instruments with a tuning of A = 415 Hz), they might find this an interesting starting point to check out more of his stuff, as recorded by FZ himself -on original instruments of the 20th century.